Note: Before beginning the programming routine, have with you every one of the keyless fobs you will be using on the car. When you enter programming mode, all previous codes will be removed from the memory. The other transmitters will not work unless you program the remotes again. 1. Key not in ignition. 2. Close all of the doors. 3. Take out the “MALL PGM” fuse in the fuse panel. Make use of the legend on the fuse panel or owner’s manual to effectively locate the “MALL PGM” fuse. 4. Stick the keys into the ignition, and switch towards the ACC position. 5. Move the key to OFF and then back to ACC within 1 second. 6. Open and close any vehicle door. A chime shall be heard when the system enters the programming mode. NOTE: In some rare cases you may also get the chimes and enter programming mode without opening and closing the door. 7. 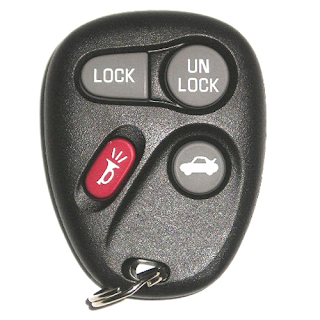 Press and hold the transmitter LOCK and UNLOCK buttons together for 14 seconds. IMPORTANT: After 7 seconds, a chime may be heard confirming successful synchronization. It is necessary to wait approximately 14 seconds for a second chime that will confirm successful programming. 8. Repeat the previous step on each additional transmitter to be programmed (including any existing keyfobs). 9. Remove the key from the ignition. 10. Install the “MALL PGM” fuse back into the fuse panel.